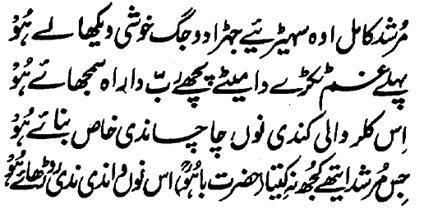 Hazrat Sultan Bahu Rahmatu-Allahe Ta-aala Alaihe says that 'the Murshid Kaamil should be such who shows the bliss of all worlds and makes his successful and victorious in Both-the-Worlds. He should first, finish the worry of sustenance and provisions from the heart of the Seeker and then should guide him towards the Sustainer . In case, the soil of the heart of the Seeker is useless and saline and is not fit for the cultivation of the Name-Allah-the-Essence (Ism-e-Allah-Zaat) , he should turn it fit and able through his Tawajuh! That Murshid, who did not show anything in this world and kept it aside with his untrue commitments with the Seeker, the Seeker should sooner shrink his hand back from that Murshid and let him flow in the spring of forgetfulness.